Rottweilers descended from the Molossus, a mastiff-type dog and probably from the Italian Mastiff. Their ancestors accompanied the Romans over the Alps by herding their cattle and protecting them from harm. It is thought that if not for these early Rottweilers, the Romans would never have survived the journey. 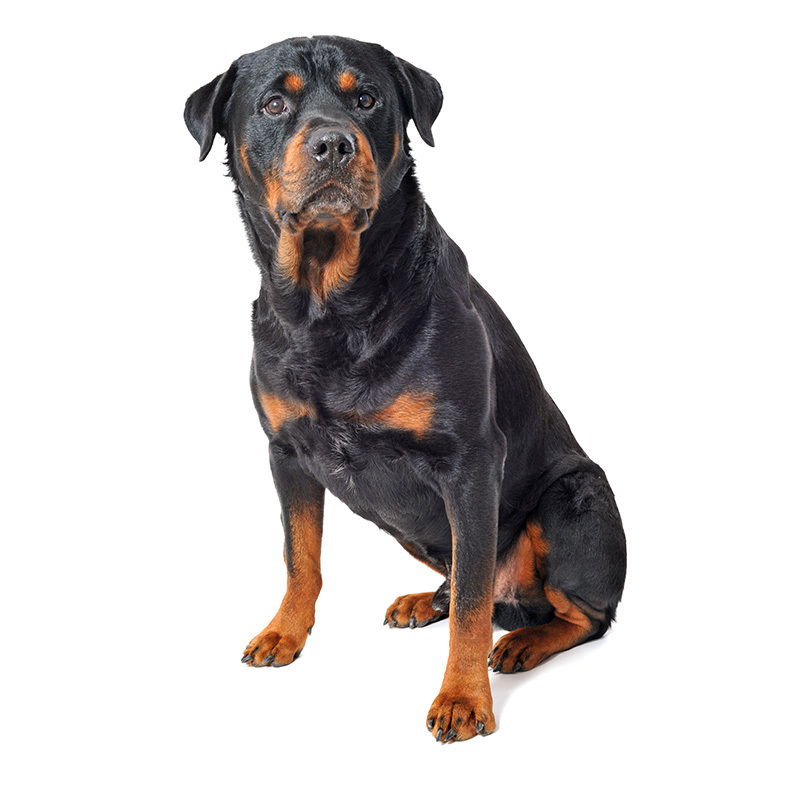 During the Middle Ages, Rottweilers were used as herders, guards, and messenger dogs. The name Rottweiler comes from the German town of “Rottweil”, which means red tile after the famed red tiled roofs of the village. Rottweilers eventually drove cattle to town in Germany for butchering. When rail transport replaced the cattle drives, Rottweilers nearly became extinct. A few dedicated breeders saved the breed in the late 1800’s and their appearance and character has changed little since then. Rottweilers are known as the world’s best guard dog because they’re tough, strong, powerful, and have a lot of endurance. They’re territorial and very protective of their home and family. Rottweilers are confident in themselves, courageous, loyal, and calm. They are watchful, cautious, and take a wait-and-see type of approach to strangers. They can be aggressive with other dogs, so you’ll need to keep a close watch as the other dog could be injured. Rottweilers love your company and want to be around you always. They love children and are very protective of them. Rottweilers are extremely intelligent and quick to learn new things. Male Rottweilers are calm and watchful, always on guard for threats to their environment, while the females are somewhat easier to control and may be a little more affectionate. Rottweilers require a firm and consistent discipline. You’ll need to establish your authority early, or they could get their bluff on you. This is a not a dog for people who lack leadership or time to devote to training. Rottweilers usually weigh between 85 to 130 pounds and stand approximately 22 to 27 inches tall. They are a large dog, and their build is sleek and muscular. They have a very short hair coat and the color is usually black with rust- colored markings. Over the centuries in Germany, the decedents of the Rottweiler drove the cattle to town for butchering. To keep their money safe from thieves after selling their livestock, their owners would put their filled purses around their Rottweiler’s neck until they returned home, as no one would ever try to take it from them. Butchers also used the dogs to pull their carts with meat. Rottweilers make excellent Police Dogs.